For most of 2018, Israel has endured constant attacks, some disguised as protests like the PLO's "Days of Rage" and Hamas' "March of Return," and others less subtle. But when Israel defends itself against guns, grenades, flaming kites, drones, or missiles, the UN is always quick to condemn it for "the disproportionate use of force," as the UN Committee on the Elimination of Racial Discrimination put it on May 15 amid reports of dozens of "civilians" killed and thousands injured. This oft-raised criticism implies, absurdly, that only proportionate responses to aggression are acceptable. There is a word for those who fight only proportionately — "losers." Every child fighting on a playground, every boxer who enters a ring, and every leader of every nation understands that in a physical conflict whoever hits harder wins. But ever since the UN came into existence, it has intervened (or tried to) in virtually every major conflict. By urging all sides to exercise restraint, feigning neutrality (except where Israel is concerned) and forcing negotiations to begin before one side has won, it has turned many conflicts into perpetual stalemates. It wasn't always this way. Before it became a UN cliché, "disproportionate force" was how wars were won. Unconditional surrender was once the goal of war. After WWII, some critics argued that the atomic bombing of Japan was immoral and disproportionate, even though it saved untold lives by ending the conflict. 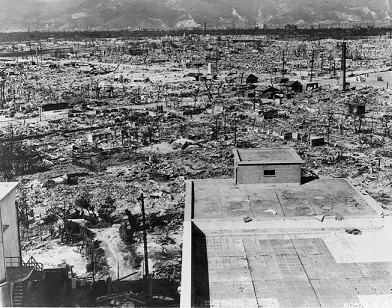 Some critics have argued that the atomic bombings of Hiroshima and Nagasaki in WWII were disproportionate, but the alternative of a full ground invasion would have cost many more lives. There might not have been a second Gulf War had the first Gulf War not ended when Chairman of the Joint Chiefs of Staff Colin Powell urged President George H.W. Bush to call off the "turkey shoot" of Iraqi tanks and armored vehicles leaving Kuwait after ravaging the country. This is ironic coming from the combat theoretician behind the so-called "Powell Doctrine" which in fact advocates the use of disproportionate force and argues that the U.S. should never "quietly acquiesce in half-hearted warfare." Half-hearted warfare is precisely what the UN wants to impose on Israel. After a UN Commission on the 2006 Lebanon War accused Israel of "excessive, indiscriminate and disproportionate use of force," Secretary General Ban Ki Moon pressured Jerusalem to pay Lebanon $1 billion in compensation. In 2011, another UN report concluded that "Israeli soldiers used disproportionate force against Lebanese demonstrators" celebrating "Nakba Day" on May 15. Special Advisers to Ban Ki Moon, Adam Dieng, and Jennifer Welsh suggested that in the 2014 Gaza War, the IDF "demonstrate[d] disproportionate and indiscriminate use of force." Towards the end of his tenure as Secretary-General, Moon acknowledged a different kind of disproportionality when he finally admitted that at the UN, "Decades of political maneuvering have created a disproportionate number of resolutions, reports and committees against Israel." Last week Moon's successor, Antonio Guterres, called for an investigation into Israel's conduct at the UN where the "disproportionate" charge against Israel was popular. UN High Commissioner for Human Rights, Zeid Ra'ad al-Hussein, found that on the Gaza border "excessive force has been used against demonstrators — not once, not twice, but repeatedly." The UN's "special coordinator for Middle East peace," Nickolay Mladenov, called on Israel to "calibrate its use of force." He conceded that Israel "must protect its borders," but added it "must do so proportionately." Kuwait called for an emergency meeting of the Security Council where, if not for a U.S. veto, action against Israel was likely. According to the Times of Israel, "Some Security Council members suggested an investigation and emphasized that Israel should ensure force is only used proportionally." Fortunately, the Netanyahu government shows no signs that it will "quietly acquiesce in half-hearted warfare." On Wednesday, May 16, amid ubiquitous media criticism for its disproportionate use of force, Israel hit back at Hamas by striking military command posts in Gaza. The next day, Hamas admitted that its fighters accounted for most (80%) of the dead "protesters" that the UN Committee on the Elimination of Racial Discrimination complained about on Monday. The Gaza strike was similar to one the prior week where an ineffective 20 missile attack on Israel was matched by a far more effective Israeli strike on 50 targets in Syria. Iran's Islamic Revolutionary Guard Corps (IRGC) was behind the attack on Israel. The Israeli counterstrike killed more Iranians than Syrians. These two demonstrations of the kind of disproportionate warfare the UN opposes signal to Israel's enemies the technical capability and political will to inflict more damage on them than they are capable of inflicting on Israel. That is how wars are won, or better yet, prevented. Sometimes the appropriate response to an act of aggression is escalation — punch harder. Prime Minister Benjamin Netanyahu cannily alluded to the UN criticism in a video statement when he said, "Iran crossed a redline. We responded accordingly." More pointedly, in a Facebook post he said, "Iran crossed a red line, and we responded proportionally."